When I was planning on making the Asian inspired brussel sprout salad I wanted to find a protein that would go well with it, preferably something that would go on the grill since the weather was still so beautiful. I ran across a recipe for Chicken Yakitori on Café Sucré Farine. Admittedly, I had no idea what this was but it sure looked good! According to google dictionary, chicken yakitori is defined as grilled chicken kebabs: a dish of Japanese origin consisting of small pieces of grilled chicken that are basted on skewers with a sauce of soy, stock, sugar, and mirin. 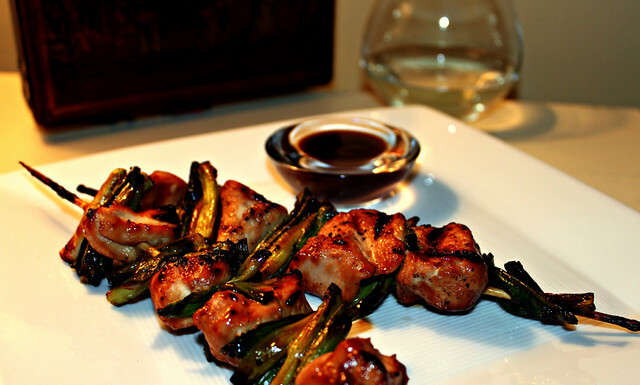 My version of Chicken Yakitori is grilled skewers of chicken and green onion pieces basted in a teriyaki-like sauce. It is easy to make and really tasty and light. The original recipe calls for mirin which is a sweetened Japanese wine, similar to sake. I had no luck finding this at the store and truthfully did not feel like spending $15 on traditional sake, so I just used some white wine I had leftover in the fridge. I am sure it had little to nothing in common with sake, but it worked famously. The skewers were savory with a slightly sweet undertone. The Perfect Pairing for this recipe is Kim Crawford Sauvignon Blanc from New Zealand. Lately I have been favoring red wine but I still love a cold, crisp white wine on occasion. This sauvignon blanc is fantastic. I have a LOT to learn about wine and tend to pretty much like everything. I have no idea how to speak eloquently of wine. I would love to be able to accurately decipher the berry notes and oaky undertones, but let’s face it… if I say that, I am totally guessing. I will say that I can always pick out the lovely grapefruit flavor in this wine. This sauvignon blanc is reasonably priced, I have seen it sold for $12-$17, and it is widely available. Buy it, sip it, love it. Combine the first 10 ingredients (through garlic) in a small saucepan. Bring to a boil, reduce heat and simmer for 10 minutes. Make a slurry of the corn starch and water in a small bowl, whisking until there are no lumps. Add the slurry to the saucepan and simmer for 5 minutes, until thickened. Using a slotted spoon, remove the garlic and ginger pieces. Set aside some sauce for dipping. Skewer the chicken and green onions, alternating until none remain. Season the skewers with salt and pepper. Grill skewers and baste with sauce. Serve skewers with reserved dipping sauce.